Creativity, Innovation, & Entrepreneurship: Jetsons, anyone? 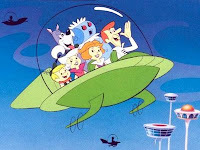 I grew up watching the Jetsons. Perhaps you did too? This disclosure ages me, but it's worth sharing with you given the recent news from Terrafugia, a startup formed with graduates from MIT. They are developing a car that morphs to its plane form in 20 seconds. After your flight (of no more than 500 miles), you can be back on the road and parking in your single car garage. I wonder if it makes the same sound as the Jetson's version (click here to hear, courtesy of dailywav.com).